Visit join.me website. At join.me we believe in more than just audio conferencing – we believe in audio awesome! Once logged in, select ‘Meeting Settings’. You’ll see your account information, and your conference options. The first is conference mode. Choose which type of meeting you want to have. You can pick video, audio, or a meeting where only the organizer can talk. Select what starts the call. You can elect to have the call start whenever anyone joins the meeting, or only when the organizer joins. Decide which hold music you want. 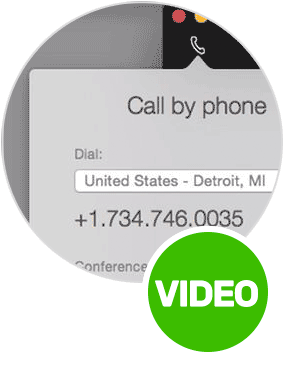 You can choose the sound you’d like your attendees to hear before the call begins. We recommend join.me funk. Click “Play a Sound”. This will notify you with a sound when someone joins or leaves your meeting. At join.me we believe in more than just audio conferencing – we believe in audio awesome! Here are some tips to optimize the audio in your meetings. 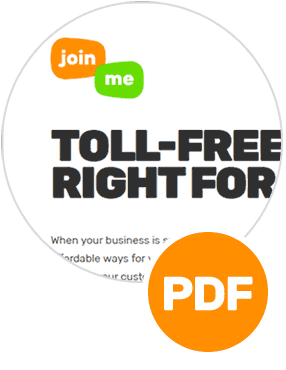 You can access your audio settings from the join.me website, “www.join.me”. Once you are logged in, select “Meeting Settings”. You’ll see your account information, and your conference options. The first is conference mode. 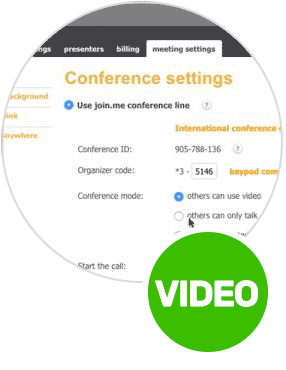 You can choose whether you want a video meeting, an audio only meeting, or a meeting where only the organizer can talk. This is great for larger meetings when you’re giving a presentation. The second feature is “Start The Call.” You can choose to have the call start whenever anyone joins the meeting, or only when the organizer joins. The third feature is to play hold music. You can select the sound you’d like your attendees to hear before the call begins. We recommend join.me funk. And finally, the fourth is “Play a Sound.” This will notify you with a sound when someone joins or leaves your meeting.